The New Year started in earnest with a trip to Peterborough for my first live Create & Craft TV show since October! I had really missed the buzz of being in the studio so it was lovely to be back crafting again, demonstrating what I think are some of the strongest ranges the Trimcraft designers have ever given us. It’s no surprise really that the Dovecraft Nature’s Grace collection has been so popular, with its birds, butterflies and florals in such a beautiful colour palette of grey (my favourite), mustard and purple. They’re perhaps not colours that I would immediately have combined on a card making project but I don’t think there’s any question that this combo works wonderfully! Back in my craft room I have been busily preparing samples using the new ranges - I have totally fallen in love with the new First Edition Hey Baby paper pad! I would have to say that new baby cards, together with christening cards and gifts, are the most popular occasions I get asked by friends and family to craft for. It’s a time when we want to give something extra special and that’s where this paper pad and decoupage pad come into their own! I had so many ideas for this pad. Initially I designed a blog project showing how you can create a beautiful birth announcement using a range of the papers and fussy cut elements. I just adore that baby footsteps paper and bunting! There are loads of papers in there that can be used for other occasions too! How about glitter hearts for a Valentine’s card or those balloons and glitter polka dots for a birthday card? The Hey Baby papers were also the perfect match for a few photos I’ve had lying around in my craft room for a good while! When my son was born, I took a photo of him every month with the intention of putting them in an album, but I never got round to doing anything with them - until now that is! I created a milestone banner using the paper pad and decoupage elements and I think it looks fantastic. I decorated it with elements fussy cut from the pad as well as some of the decoupage shapes and sentiments. A few bows and a felt button later and - hey presto! I also created a scrapbook layout using a cute and cuddly picture of my son with a glint in his eye! He has a cheeky face and this picture captured it perfectly. This just goes to show that the images and sentiments in the Hey Baby range go much further than just new-borns. ‘Hey Baby’, ‘So Much Love’ and ‘Bundle of Joy’ work really well with the image and the paper patterns featuring stars, stripes and triangles can be used for any occasion. My little baby boy – who is now almost 6 – loved seeing his photos used on these projects and these are items that he will treasure as he gets older too. There’s something really special about crafting with photographs as it allows us to hold on to those special moments and look back with very fond memories. I’ll see you in February when I bring this paper pad, together with Perfect Allusion and the very exciting launch of the first V&A Papercraft Collection to Create & Craft TV. I can hardly wait! 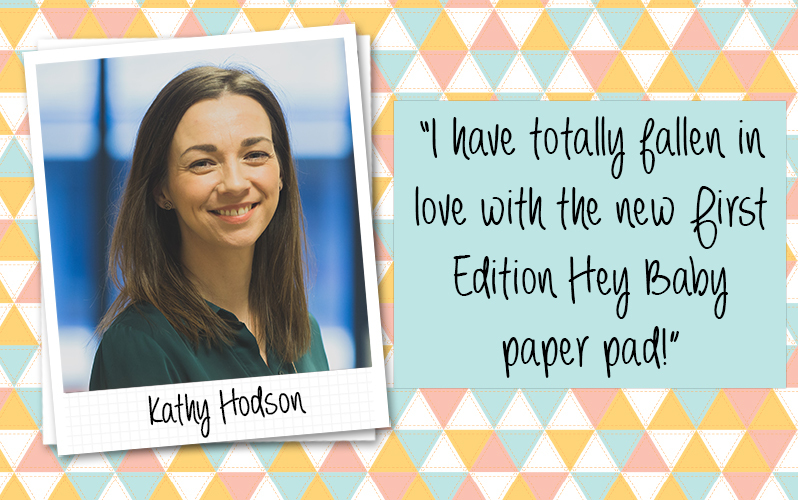 I can't wait to see what you've been making with the Hey Baby collection when you start uploading your makes to the Inspiration area. Thank you. Really enjoyed the new First Edition pads and the Nature's Grace collection.